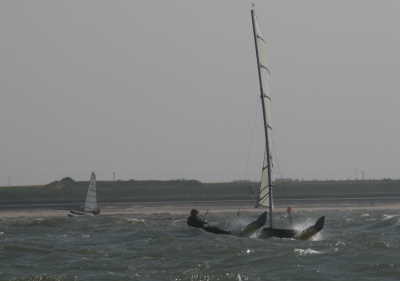 The Catapult TT season blasted off at Minnis Bay in a demanding NE breeze, Force 4-6, onshore for the north Kent coast. It is the home club of new Catapult sailor Sandy Jordan, and her partner Simon Northrop, who makes the successful new sail for the class. The initial wind against the tide with steep seas, and the later strengthening of the breeze, gave testing conditions for three back-to-back races on a windward-leeward course. The long open-water legs meant that there was little to watch out for from the Hurricanes sharing the course. 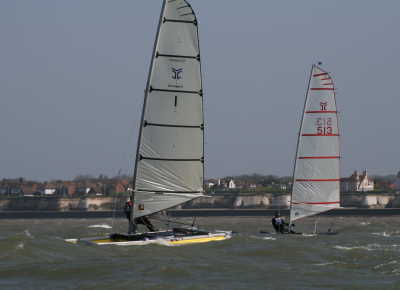 The course took the boats outside the very long start line downwind, so that if the starboard side was elected there was effectively a long triangle (and a broad lead with dashes down waves, at speed and with heavy helm) The option to port of the Committee boat was dead downwind, and more sedate but slower. 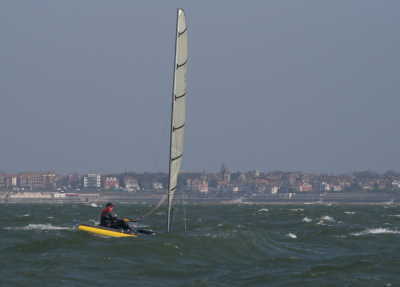 On the second lap, Alex Montgomery, following Alastair Forrest around the windward mark, nosedived as he powered up downwind and capsized, recovering quickly. Alastair, having to turn back to round the start buoy, had Alex and Paul come up, and missed tacks pushed him to fourth. Cliff carried on ahead, to be finally caught by Alex on the last beat. In Race 2, Cliff again got way well, with Alex moving fast and into the lead. Again, missed tacks in the steep seas were decisive, while boat speed remained evenly matched. Alastair retired to shore when the tiller bar pintles loosened, and Alex led Cliff and Paul in. The Catapults were sailing races of around 75 minutes, and the demanding conditions had drained Cliff and Paul, who elected to miss the third back-to-back. Alastair returned, but Alex led well away, with a good lead after another missed tack. 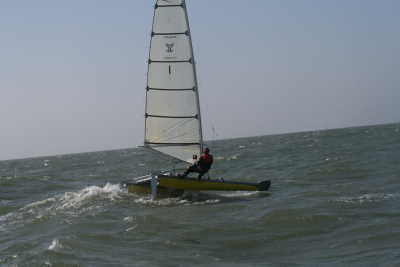 Alex was way ahead, and Alastair followed him in, the last boat left on the water amongst the whitecaps. Alex realised later that, tired after three taxing races, he had gone through the start line downwind on the third, and he withdrew. The next day dawned sunny and warm everywhere in southern England except the North Kent coast, with a cold onshore NE Force 4-5 and cloud. The three remaining Catapults watched the breaking seas and came to the mature judgement that the conditions were unlikely to be survivable, and even if survived, not enjoyable in any normal sense, a conclusion eventually reached by all the fleets except a small handful of the F18s. 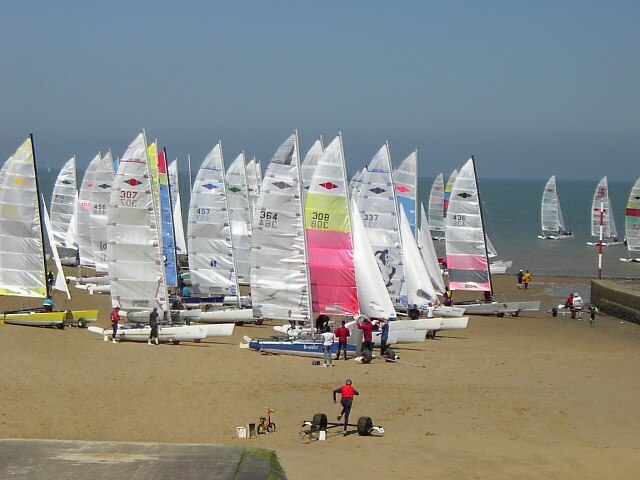 It was a bracing start to the season, and good to be welcomed at Minnis Bay for the first time there.